MACH Engineering can perform rigorous mass and energy balance calculations for a wide range of industrial steady-state processes with HETP calculations. MACH uses Aspen Plus simulation software which is used in design as well as in operation of existing plants for process optimization, troubleshooting or debottlenecking, plants revamping or performing front-end engineering analysis. Please click on the link below for different areas MACH can assist you with your process engineering needs. 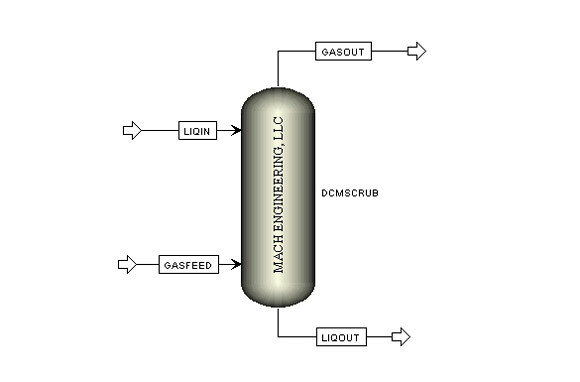 Flue Gas with 9% HCl and 0.1% Chlorine at 482F consist of two tower scrubber system. First tower was design to cool the gas down to below 200F and remove some of HCl and Chlorine. Second tower was design to absorb HCl and Chlorine with water. In first tower, simulation results shows that 2 Theoretical trays (stages) are required to achieve the desired gas cooling, packing used is Ceramic WavePak with packing height of 5 ft (Safety Factor is 30%) and diameter of 9.5 ft. 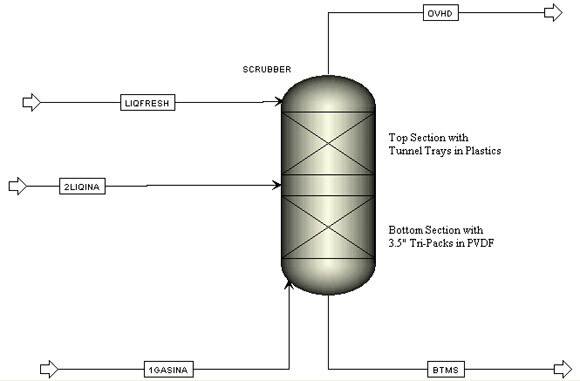 In second tower, simulation results shows that 2 Theoretical trays (stages) are required to achieve 90% HCl removal, packing used is 3.5″ Tri-Packs in PPG with packing height of 7 ft (Safety Factor is 30%) and diameter of 9.5 ft.
Also known Chlorine Drying Tower with Sulfuric Acid Solution. Gas with 98% Chlorine at 57F is to be absorbed in Sulfuric Acid Solution. Customer wanted to increase the capacity of the existing Chlorine Drying Tower and did not have any previous data available. MACH Engineering Proposed to regenerate all data for existing tower and redesign new towers for future systems with increased capacity. Simulation results shows that 2 stages are required. Bottom stage is with 15 ft of packing height of 3.5” Tri-Packs in PVDF (Kynar™) and top stage is with 5 Tunnel Trays in Plastics. Tower diameter was 6 ft. Stage efficiency was calculated and Sensitivity Analysis was done with multiple cases for current design with different flow rates. Hydrocarbon gas at 160F had 8500 ppm of Hydrogen Sulfide and 7700 ppm of Ammonia. 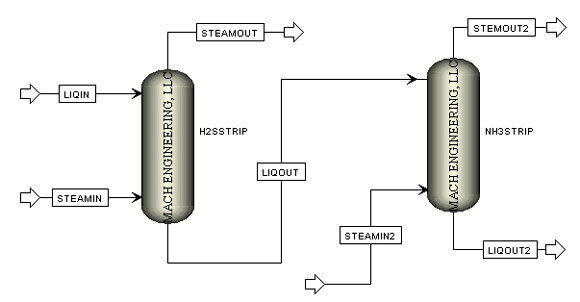 Due to very high inlet concentration Steam Stripping with two towers in series were used to remove H2S and NH3. Simulation results shows that 3 Theoretical stages are required with 17 ft packing height of 40mm VSP® or IMTP® in Stainless Steel. Tower diameter of 10 ft was calculated. In first tower, simulation results showed that 3 Theoretical trays (stages) are required to achieve 99% H2S removal and some of NH3, packing used was 40 mm VSP® in SS with packing height of 17 ft. In second tower, simulation results shows that 5 Theoretical trays (stages) are required to achieve 99% NH3 removal, packing used was 40 mm VSP® in SS with packing height of 5 ft.
Hydrocarbon Gas (Methane to Octane) was contaminated with Dichloromethane (DCM) and Carbon Tetra Chloride (CCL4). Proposal was sent to clean the gas using Diesel II Fuel. Simulation results shows that 5 Theoretical stages are required with HETP of 3 ft and total 15 ft packing height using 25 mm VSP® or Metal Saddles in Stainless Steel. Tower diameter of 18 inch was calculated based on the pressure drop requirement from customer. Tower Internals were design to handle minimum of 30 cfm and maximum of 100 cfm.